The National Renewable Energy Laboratory (NREL) is evaluating six scenarios for the Los Angeles grid to reach 100% renewable or zero-carbon electricity by 2045 or sooner, and an advisory group is providing input. The “LA Leads” scenario, for example, would reach 100% zero-carbon electricity (including existing nuclear) by 2035—ten years earlier than state policy under California’s SB 100. “LA Leads” would reach 100% renewables by 2045. The NREL study could give early insight regarding paths for California and other states to achieve their renewables and zero-carbon targets. 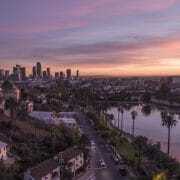 The six scenarios generally begin after 2030, when the Los Angeles utility plans to reach 55% renewables in its electricity mix. Key to the study’s cost projections will be the projected costs of renewables from 2030 onward. The study will show how the flexibility to add transmission may reduce system cost, and will consider moderate and high levels of “load modernization”—that is, energy efficiency, demand response, and electrification of transport and heating. Two scenarios will evaluate a high level of distributed generation. All six 100% renewables scenarios specify increased “load modernization” beyond the Los Angeles utility’s current plans, which suggests that this strategy may be essential to reaching 100% renewables. With increasing load modernization, increased electric vehicle charging is offset by increased efficiency, while the system gains flexibility from demand response. 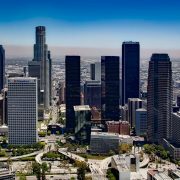 The effort is the first “comprehensive analysis of an electric grid as large and comprehensive as LA’s power system to reach 100% renewable energy,” according to the Los Angeles Department of Water and Power (LADWP), which is managing the advisory group process and overseeing the study. Fifty NREL staff members are working on various stages of the study. The study’s main goal is to evaluate the options and tradeoffs between different approaches to realizing a 100% renewable power system, explained NREL’s Daniel Steinberg in a November advisory group presentation. The study was launched by a unanimous vote of the Los Angeles City Council, which requested study assistance from the U.S. Department of Energy, which operates national labs including NREL. The scenarios are shown in the blue columns in the chart below, while the reference cases are shown in green. Elements that differ across scenarios are dark blue. Technologies marked “Y” will be included only if they help achieve a least-cost solution for that scenario. Two storage technologies are available to all scenarios: batteries, and “electricity to fuel” (e.g., hydrogen) matched with fuel cells. Generation from biomass or biogas are options in all but one scenario. The “LADWP” reference case reflects the Los Angeles municipal utility’s most recent resource plan, while the “SB 100” plan, named after California’s renewables and zero-carbon law, would permit the use of tradable renewable energy credits (RECs) to offset continued use of natural gas. The completed study will indicate whether allowing added transmission results in cost savings. That’s because “LA Leads,” which permits moderate added transmission, may be compared to the “High Distributed” scenario, which permits no additional transmission. The two scenarios are otherwise identical in 2045, as “LA Leads” is 100% renewable by then. Three scenarios will show the tradeoff between varying levels of distributed generation (DG) and added transmission. Those comparisons, once the study is completed, would be “High Distributed” (high DG, no added transmission), versus “Load Modernization” (“balanced” DG, moderate added transmission), versus “Transmission Renaissance” (low DG, high added transmission). The sixth 100% renewables scenario, “Emissions Free,” would not permit biomass or biogas; if those technologies are cost-effective in other scenarios, this scenario will indicate the added cost of excluding them. A seventh scenario, “High Load Stress”—where electrification is high but there is no increase in energy efficiency or demand response, stressing the grid—may never achieve 100% renewables; tradable RECs are permitted to achieve “100% net” renewables. Having defined the scenarios with input from the advisory group, NREL will now project the costs of each scenario, using a series of computer models, together with projected costs foreach generation and storage technology from NREL’s Annual Technology Baseline. As the graphic indicates, NREL’s modeling of each scenario begins with a capacity expansion analysis, to establish a set of resources that can meet the projected demand for electricity. The modeling of each scenario includes only those technologies that are permitted under the definition of the scenario. The capacity expansion analysis finds the optimal set of resources, considering added generation and storage, the level of transmission, and retirement of generating units. NREL conducts this analysis based on hourly dispatch for four representative days within the year, using the models RPM, dGen and DISCO. NREL will model utility-scale solar with the option to operate in “full flexibility” or “dispatchable” mode, which permits integrating more solarcost-effectively. The modeling will also consider the option of “overbuilding” solar and accepting substantial curtailment—a strategy found to contribute to a least-cost long-run resource plan for Minnesota. Year-round operating cost estimates are approximations at this stage. NREL will use the PLEXOS model for the next step for each scenario: production cost modeling. This step validates the capacity expansion results and projects the year-round cost of operating the selected generation and storage resources in a least-cost manner, considering dispatch at five-minute intervals throughout a 12-month period. Then NREL will conduct a power-flow analysis to identify any added capital investments needed to mitigate power-flow constraints and very short-term disruptions in the grid. As indicated by the green and red arrows in the graphic above, the modeling may entail more than one iteration. NREL will project the system costs under each scenario. Preliminary electric system results are due in September. The Los Angeles Department of Water and Power will then conduct a rate impact analysis, which will be reviewed by a rate payer advocate, with the results presented to the advisory group. Six paths to 100% renewables for Los Angeles, by William Driscoll, PV Magazine, January 10, 2019. UCLA and LADWP to fund water and energy research benefiting customers, by Asma Mahdi, UCLA Newsroom, November 13, 2018.